Welcome to fisherman's paradise, with a buoyant year-round opportunity to land the big one. Enjoy a variety of inshore, nearshore and offshore charters by power boat, or paddle out on a local kayak fishing adventure. This is one of the fastest growing sports and is offered in the Inland Waterway Trails at Palmetto Bluff. The Mirage Drive kayaks allow access to areas where powers boats cannot venture. Redfish, Bream & Bass, the targeted species. Instruction, Hobie Mirage pedal-driven fishing kayak, equipment, guide, bait, and tackle included. 3 people maximum per trip. Ask about special member pricing when calling. Bring the family out for an evening of fun! This 3 hour shark fishing excursion includes everything you need: bait and tackle, U.S. Coast Guard licensed captain and fishing guide, licensing and iced cooler. 4 people max per boat. This private fishing charter is perfect for families & folks looking to "wet a line" rather than the serious angler. Offered aboard our 24' custom designed Carolina Skiff, this trip includes everything you need: bait and tackle, U.S. Coast Guard licensed captain and fishing guide, licensing and iced cooler, 8 people maximum. 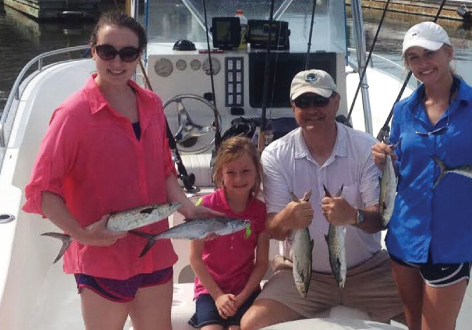 Join one of our expert fishing captains for a private, 4, 5, or 6 hour fishing charter. Most of the year, in-shore fishing focuses on the local Redfish (also called Red Drum or Spot-Tail Bass). Spin or fly-casting is available with expert guides in pro anglers or power catamarans, appropriate to group size and conditions.